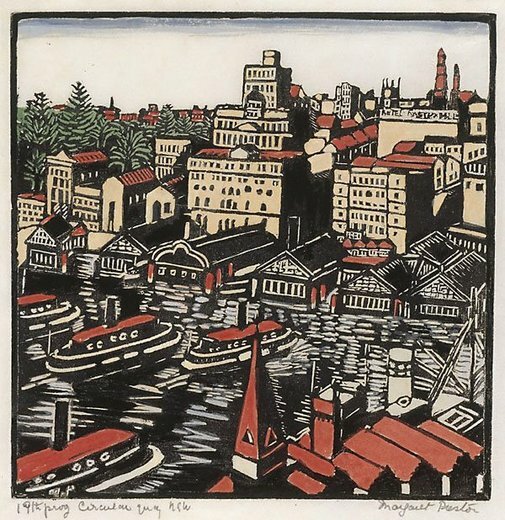 Margaret Preston was one of the most innovative and prolific printmakers of her generation, producing etchings, monotypes, screenprints and stencil prints, as well as various types of relief prints, including woodcuts, linocuts and masonite cuts. These classic images of Sydney Harbour were made by Preston in 1925 and are some of her best-known and most popular prints of Sydney. It was an important year for Preston and her activity as a printmaker, when she included sixty-five prints in a joint exhibition in Sydney and Melbourne with her friend and contemporary Thea Proctor, whom she had introduced to woodcuts. The exhibition received favourable critical comment and the prints attracted considerable public attention and appreciation.